Three and a half days. This is how long it took Lady S to travel from the Royal Van Lent shipyard of Feadship down to Rotterdam and onward to her first sea trials on the North Sea. Along the way, she passed through more locks, drawbridges, and waterways than you can count on both hands. The most incredible part, though, is seeing how Lady S squeezes through the Dutch aqueducts, notoriously narrow in many areas. Shot several weeks ago, this video reveals how the 305-footer (93-meter) made the delicate journey. It took half a week for a few reasons. First, from start to finish, Lady S maneuvered through a grand total of 17 structures. Specifically where bridges were concerned, not all were initially accommodating, either. As you’ll learn, with one particular bridge, portions needed to be removed to let her pass. Second, you may find yourself holding your breath as Lady S squeezes through the passages. In fact, several times, there’s barely enough space between her and the walls. One slight miscalculation, and the nearly 46-foot-wide (14-meter-wide) megayacht would scratch up her paint job. Traditional fenders are of no use for these locks, either, due to mere centimeters of space to spare. Perhaps the best hold-your-breath scenes, though, are the aerial shots of the megayacht passing through the bridges and locks. 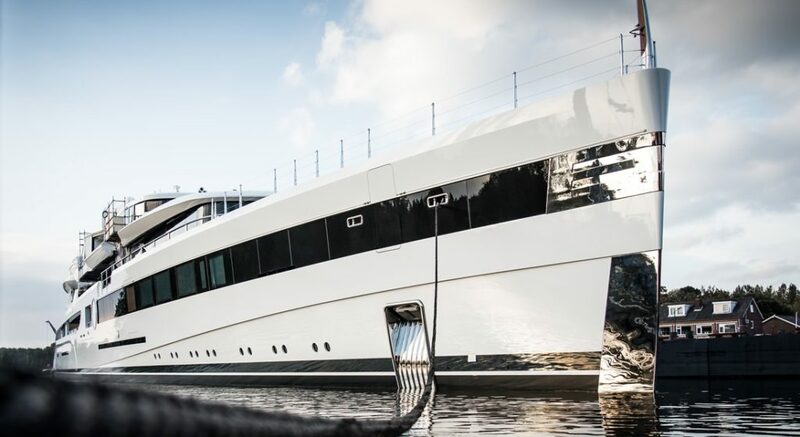 Ultimately, Lady S makes her way to Amsterdam, to the brand-new Feadship facility there. She’s the first project to “christen” the shed, too.